A diet your kitten is guaranteed to love,"Smitten Kitten" is a recipe packed full of salmon and amino acids. Complete, palatable and natural in its nutrient content, Smitten Kitten is free from all artificial colours, flavours and preservatives so you can be assured your growing kitten is getting the best support possible. The recipe is also fortified with calcium for healthy bone growth, as well as DHA to support learning and brain development. Cats need protein to thrive and with Smitten Kitten you can be sure your feline is getting just what it needs. Freshly Prepared Deboned Salmon 27%, Dried Fish 18%, Dried Chicken 18%, Rice, Potato Starch, Pea Starch, Dried Egg, Chicken Fat 4%, Salmon Stock 3%, Salmon Oil 1.5%, Oats, Dried Tomato, Seaweed, Vegetable Fibre, Dried Carrot, Dried Cranberries. Crude Protein 39%, Fat Content 18%, Inorganic Matter 9%, Crude Fibre 2 %, Moisture 7%, Omega-6 (2.8%), Omega-3 (1.2%). Taurine 1,000mg Vitamin A 30,850 IU, Vitamin D3 2,095 IU, Vitamin E 400 IU. Ferrous sulphate monohydrate 741mg, zinc sulphate monohydrate 514mg, manganous sulphate monohydrate 101mg, cupric sulphate pentahydrate 37mg, calcium iodate anhydrous 4.55mg, sodium selenite 0.514mg. 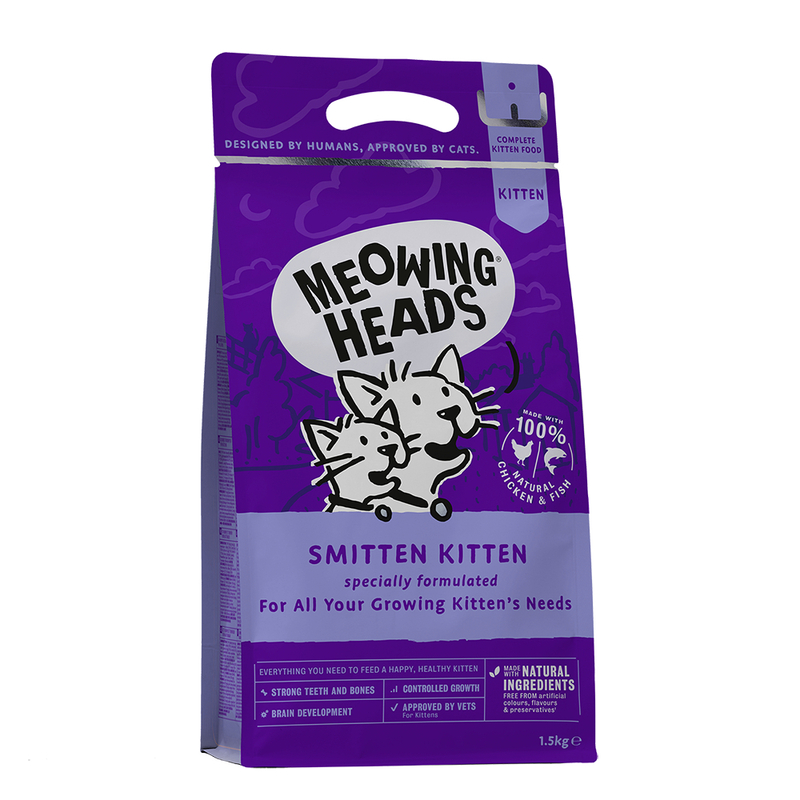 There are currently no questions for Meowing Heads Smitten Kitten Food - be the first to ask one!